As a symbol of our fiscal responsibility, NAMI Keystone Pennsylvania was awarded the Seal of Excellence by the Pennsylvania Association of Nonprofit Organizations (PANO) for successfully completing the Standards for Excellence accreditation program. 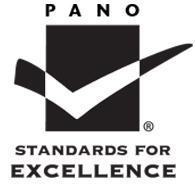 PANO’s Seal of Excellence is a symbol of exceptional nonprofit management. Organizations that display the Seal have information available to the public, provide truthful responsible stewardship of all donations, and provide a voice for their constituents. NAMI Keystone Pennsylvania provides life-changing education classes and support groups – that are all free. Your donations to NAMI Keystone Pennsylvania fund crucial programs that support and educate individuals living with mental illness and empower them to get help. Our programs also raise awareness among parents, caregivers, teachers, and professionals so they are better informed about mental health. Gifts and donations may be restricted by a donor for use in any specific area, and/or for any stated NAMI Keystone Pennsylvania purpose or program, and these requests must be honored. NAMI Keystone Pennsylvania is a 501(c)(3) nonprofit organization. Donations are tax deductible to the fullest extend allowed by law. The official registration and financial information of NAMI Keystone Pennsylvania may be obtained from the Pennsylvania Department of State by calling toll free within Pennsylvania 1-800-732-0999. Registration does not imply endorsement.